This is my go to dessert. I seem to always keep the ingredients in my pantry (pie filling always goes on sale this time of year and I stock up). It is also a great dessert to prep ahead of time when bringing someone a meal. I just use a disposable pie tin and send it with cooking instructions so it is warm and ready when they are. It takes a few minutes to assemble, bakes while you are enjoying dinner, and even tastes great straight out of the fridge for breakfast the next day with your morning cup of coffee. Just dump the pie filling in a pie dish. Melt the 1/2 cup stick of butter in the microwave. Stir in the cake mix until combined and crumbly. Spread evenly on top of pie filling. until slightly brown and bubbly. This is one of my favorite recipes! Except here, we call it dump cake because I dump everything in the dish and bake until it's done. I don't even bother combining the butter and cake mix. I just slice it and lay it on top and let it melt in the oven! me 2 that is what I know it as but my recipe calls for a can of crushed pineapple & then pecans on top along with the butter, hmm soooo GOOD!! Ooooh looks delish, in the UK we would probably call this a cherry crumble. We call that a dump cake as well. even better if you layer in some pineapple. Great with strawberries too. but i'm actually looking for um, printable recipe cards or some way to type recipes on to them online and then print. and that one is super cute. And I don't know if that is a table cloth or what.. but those polka dots are seriously cute! this looks simple enough for even me to make. one question: is one stick of butter 1/2cup or 1/4cup? your stick looks littler than my sticks. Thank you for sharing! I LOVE your super easy, super yummy recipes. Life is busy enough to not need complicated recipes, especially desserts which we always seem to need for church, bake sale, meetings, etc.. I make this, or at least something very similar. 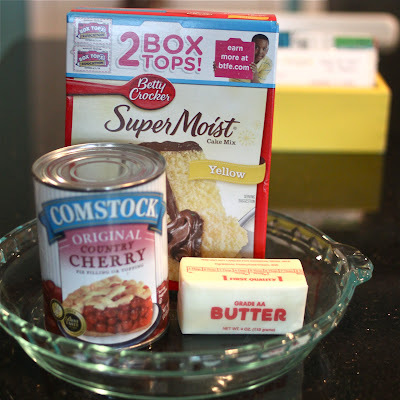 We call it a dump cake and we also add a can of crushed pinapple to the cherry pie filling...Yum! 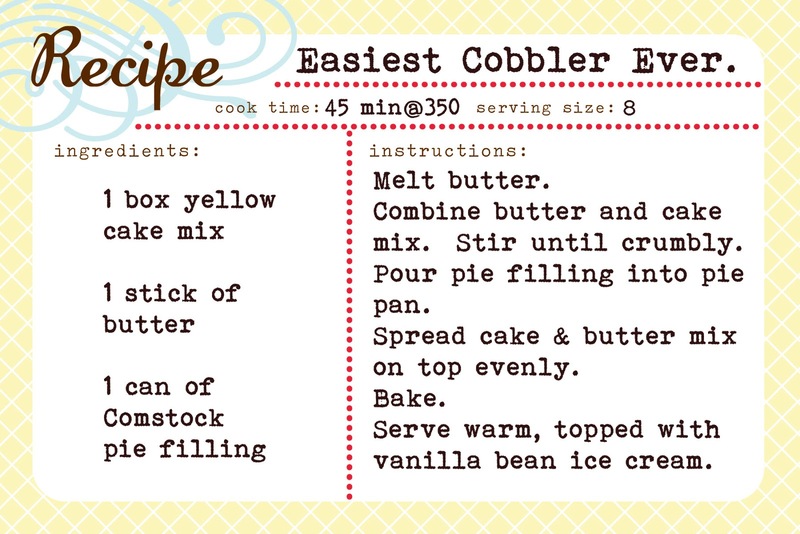 My mama made this all the time...I love it...however, I don't have the recipe, so this is perfect!! Here in Michigan that is referred to as Dump Cake :) Super easy and yummy! We put pie filling in pan dump cake mix on top and poor melted butter over the top then bake!! YUMMY!! I make it w/ sliced peaches in heavy syrup and just drizzle the melted butter over it. And I eat the leftovers for breakfast too - it has fruit in it, so it's good for you, right? yummmmmmy! and so easy! I am a lover of apple too! might have to try this very soon!! and I need those box tops if you don't save them!! Oooh!~ Gonna make this one soon! I love this recipe too! It's SO EASY and delicious! Can't beat that! looove this! i make mine with blueberry and serve with whip cream. delish. so easy if you have unexpected company because the ingredients are always on hand! :o) great. now i need to make that this week. That looks so yummy and easy enough for me to try. Thank you so much for the awesome recipes. My family loves your sante fe soup so much my in-laws call and ask when I am making it next for the left-overs! You are an inspiration! We call that dump cake, our favorite uses canned peaches. Also I add a sprinkling of cinnamon to it and sometimes I sprinkle the top with brown sugar and chopped pecans to give it a little extra crunch, it's sooo good! We eat this on EVERY camping trip. Chris makes it in his dutch oven over the campfire. Awesome. It is basically the only thing he cooks, but I'll take it! This same recipe works to make peach cobbler. Just use canned peaches in light in their own juice or light syrup. yummy! wonderful recipe! thank you!!! Oh man. I really should not have read this. It looks SOO good and I'm trying to lose weight by Christmas. Man, this is going to ruin my life. My mother-in-law makes this and calls it cherry dump cake. It is soooo good and she always makes it for my sister-in-law and I while we are pregnant. It's been a while since I had it, but I am newly pregnant right now and just seeing it makes me crave it. All I am saying is I might be making some today. You are my new cooking hero. Julie, I want to know how you made that recipe card. It's so cute. I post lots of recipes and should really know how to do that. LOL! yet another reason you are awesome. will be making asap. with a hat on to hide my roots. I love, love, love this cobbler! A friend introduced me to it last year except I add a little cinnamon to it. So easy but so impressive tasting! I hearted you on my blog. i've always loved this kind of cobbler. I used to make it a bunch when i first got married and i guess i forgot about it. So glad to be reminded....i will be buying those ingredients tomorrow! thanks! It is my turn to make dessert for our Bible study group. This will be perfect! I usually make this cake in the crock pot. Same process, cover and cook on low for 2-3 hours! i know that i should share this with my girlfriends, but i want to keep it as my secret weapon! Yum!! I have it in the oven now. Lemon is really good too! Makes amazing Cakey lemon bars.